You are currently browsing articles tagged God Spirit. Three years ago, I pitched the idea to Wayne Sparkman, archivist of the PCA History Center, about a day by day Presbyterian web site to focus in on persons, places, and events associated with historic Presbyterianism. He graciously received the idea and This Day in Presbyterian History was born. We wanted it to be a devotional, so Scripture reading through the Bible, confessional readings in our Westminster Standards, and a practical Words to Live By section were placed along with each historical post. By and large, after three years of one thousand and ninety six posts, we believe that it has turned out to be what we prayed and planned it to be, in His providence. However now, I am leaving the co-authorship of it, so as to engage in other writing pursuits. (By Wayne’s kind invitation, I plan to write some posts for 2015 as a guest author.) My prayer is that God’s Spirit will continue to help our subscribers learn from the past and continue to engage in the work of the Lord for His glory. It has been a pleasure working with David these past four years. When he called to suggest the project, I was cautious, having some idea of the time it would involve. When I did finally agree that the PCA Historical Center would host the blog, I asked David to write a year’s worth of posts in advance. And he did it! No backing out then. So we unveiled the blog on January 1 of 2013. Now we are about to enter our fourth year, and there is still so very much that we can write about. From time to time you may notice that we might repeat a post from a prior year. Generally this is when time simply doesn’t permit writing new material. Or on a few occasions, even with a deeper pool of resources at hand, there still are a few dates when it seems that not much happened. I will sorely miss David’s invaluable help with this blog. He’ll be back with a few posts through the coming year, and who knows, maybe in 2016 he’ll return with still more frequent contributions. I feel I’ve gotten to know him rather well, even though we’ve never met face to face. May our Lord bless these projects that David has laid out for the new year, and may our Lord strengthen my hand to continue this blog, to His glory and praise. —Wayne Sparkman, director, PCA Historical Center. Our title came from the pen of C.H. Spurgeon who recommended the reading of Andrew Bonar’s Memoir of Robert Murray M’Cheyne. This author was given the Memoir to read in the beginning of his college years in preparation for the gospel ministry. I have returned to it frequently in some fifty years of ministry. It is that beneficial. Robert Murray M’Cheyne (sometimes spelled McCheyne) lived between May 21, 1813 and March 25, 1843. If you count those years, you immediately realize that he lived on this earth for only thirty years. And only seven of those years were spent in pastoral ministry. Yet the shortness of his life and ministry were abundantly fruitful in many respects, not the least of which was evangelistic at home and abroad. Countless Scottish people acknowledged him as their spiritual father in the faith. He was born on May 21, 1813 in Edinburgh, Scotland, the youngest child of Adam M’Cheyne. He studied at the University of Edinburgh in 1827, distinguishing himself in all of his classes. His lifestyle was however given over to the pursuits of pleasure rather than the pursuit of holiness. The death of his older brother, David M’Cheyne, brought him to a sense of personal spiritual need. David had often prayed for his conversion. Robert resolved to “seek a Brother who cannot die.” Reading the Bible and various books were eventually used of the Lord to bring that spiritual change in his soul. His diary records evidences of a spiritual change. Licensed to preach the Word by the Presbytery of Annan in 1835, after a brief stint as an assistant pastor, he was ordained on November 24, 1836 and called by a new congregation in Dundee, Scotland. Soon crowds were attending the preached Word. However, the labors of the pastoral ministry brought physical problems, which required him to desist for a season during the winter at Edinburgh. Pastor M’Cheyne always felt that his time on earth would be short. Whether this was revealed to him by God’s Spirit in some way, or it was simply a recognition of his own bodily weakness, this author doesn’t know. But he always had a sense of his own mortality. And indeed, after a church-sanctioned trip with Andrew Bonar and other ministers to Palestine, to determine opportunities for the conversion of Jews in 1839, he returned to Scotland. It was but four years later in 1843, that he was seized with typhus fever and went to be with the Lord on March 25, 1843. Words to Live By: It was his closest friend Andrew Bonar who wrote his Memoirs in 1844. In less than three years, seventeen editions were sold. Banner of Truth first reprinted it in 1960. Moody Press also came out with an edition of it. If you, dear reader, have never opened its pages, buy and read the book. If it has been some time since you have perused its pages, read it again, and feast upon the Spirit’s work in the life and ministry of this young man. It will repay your time and effort. WLC 156 — “Is the word of God to be read by all? Initially there was no real problem with the written standards for the Presbyterian Church in America. Ministerial students were simply tested for their learning and soundness in the faith. But a controversy in the mother country soon changed this. So the question arose, should teaching and ruling elders be required to subscribe to the subordinate standards of the Westminster Assembly in their entirety, or just for their essential truths? The fact that so many officers were still in the process of emigrating to the colonies made this a relevant question for the infant church to resolve. 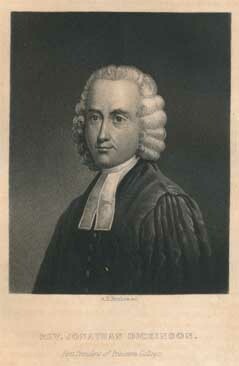 Conscious of the potential for schism, on September 17, 1729, Jonathan Dickinson became the main proponent against the total subscriptionist party in the church. His argument was simple. He believed the Bible was the sufficient rule for faith and life. Subscription must be adhered to it and to it alone, not to some man-made summary of it, as good as it might be. The total subscriptionist side also believed the Bible was all-sufficient for doctrine and life, but were equally convinced that the Westminster standards of confession and catechisms offer an adequate summary of the Old and New Testaments. To receive it and adopt it in its entirely would stop any heresies which may invade the church from either within or without the church. At the synod in 1729, Dickinson and his followers won the day with what has become known at the Adopting Act of 1729. The document stated that on the one hand, there was a clear requirement to receive and adopt the Westminster Standards. However, if an elder, whether teaching or ruling elder, had an exception to those standards, he was to make known to the church or presbytery his exception. The latter body would then judge whether the exception dealt with essential and necessary articles of doctrine, worship, or government. If it did not, then he could be ordained without official censure or social ostracism. The entire body of elders gathered at the Philadelphia Synod gave thanks to God in solemn praise and prayer that the resolution of this potential schism had been averted and unity was maintained in the infant Presbyterian church. Words to live by: It is always good that disunity should be avoided and unity be maintained. But at what cost, is the question? The compromise here looked good on the surface. But presbyteries and synods and assemblies are made up of fallible men who can, sadly, declare that the basic truths of the Christian religion are not necessary to be held, as is the case now with several liberal Presbyterian bodies. Obviously, much prayer must be made for those who instruct and rule over us, that God’s Spirit will keep the visible church pure in both faith and life. The true key to doctrinal unity springs from a daily awareness of our own sinfulness, from hearts broken before the Lord in godly humility, Seeking the forgiveness found in Jesus Christ alone. See also, The Meaning of Subscrption, by Rev. Benjamin McKee Gemmill. WSC 105 “What do we pray for in the fifth petition? With little or no Presbyterian history to find on this May 14 day, we go to the words of Shorter Catechism No. 31. It tells us that Effectual calling is the work of God’s Spirit, whereby, convincing us of our sin and misery, enlightening our minds in the knowledge of Christ, and renewing our wills, he does persuade and enable us to embrace Jesus Christ, freely offered to us in the gospel. On the one hand, this is rich theology. It defines for us the biblical doctrine of vocation. It follows catechisms which tells us that we are made partakers of the redemption purchased by Christ by the effectual application of the Spirit of God who works faith in us and unites us to Christ. It precedes catechisms which define the benefits of vocation as being justification, adoption, and sanctification. But on the other hand, this is devotional. This is an evangelistic prayer. It can formulate the requests which we make every time we or someone else shares the gospel of eternal life with the lost. We can make each one of the verbal phrases in this catechism a prayer petition for our unsaved loved ones, or our neighbors outside of Christ. Let’s look at the teaching first. The Spirit first applies the effectual calling upon our minds by convincing us of our sin and misery. This work of God’s Word, and especially His law, as well as His Spirit convinces the heart of the unsaved as to his deserved guilt, the dreadful wrath of God, and endless miseries of hell, if we reject his gospel. Then a second application of the mind by the Word and Spirit is enlightening in the knowledge of Christ. We know with conviction that Christ is the only answer to our sin and misery, that He has undertaken to save us and will be faithful to perform it. We in short discover Christ in the gospel. Our spiritual eyes are opened to His person and work on our behalf. Second, the Spirit applies the effectual call upon our wills, by renewing them. This is a secret, spiritual. and mysterious work, as Christ compares it to the wind which we hear but don’t know where it comes from or goes to in John 3. But the full result of all this convicting work upon the mind and will of the sinner will be to persuade and enable him to embrace Jesus Christ as He is freely offered in the gospel. Christian, recognize that this is your spiritual history. You might not have been aware that all this was happening inside of you. But while others might have been externally called by the Word of God, you were called externally by that same Word and internally persuaded to become a believer. None but the elect of God are thus called and chosen by the Word and the Spirit. But this is more than mere doctrine, as important as that is. It is also devotional. The next time you present the gospel to someone else, or you hear it presented in a public meeting, like a church service, turn these expressions into prayer requests. Holy Spirit, convince the lost of their sin and misery. Enlighten their minds in the knowledge of Christ. Renew their wills. Persuade and enable them to embrace Jesus Christ this day as He is freely offered in the gospel. Words to Live By: For the purposes of both doctrine and devotion, it is important to memorize this answer. If you do, and this contributor did so a long time ago, it is a comforting assurance in days of doubt which the old serpent enemy casts towards us, as well as an effective evangelistic tool to use anywhere and everywhere. Your assignment is, memorize Shorter Catechism 31. In defining the term “prophet,” we see someone who is qualified and authorized to speak for another.” Immediately, we see Jesus is a “spokesman” or “mouthpiece” for the Father. The writer to the Hebrews hits us right at the first in chapter 1, verse 1 and 2 of this office. He writes, “Long ago, at many times and in many ways, God spoke to our fathers by the prophets, but in these last days he has spoken to us by His Son . . .” (ESV) God the Father has spoken to us by His Son, the Lord Jesus. The instrument and agent of Jesus as the prophet of His Father are specified as “his Word and Spirit.” Notice the conjunction “and.” Both God’s written Word, the Bible, first spoken, and then written, and God’s Spirit are necessary for the effectiveness of the prophetic message. Both were promised, and both were given to the church of the ages for their salvation and sanctification. Revealed to the church as the subject of His prophetic words, our Confessional fathers tell us that it was “the will of God for our salvation.” Jesus did not come to earth to answer every question upon the mind of man. He didn’t come to speak of art and science and history and math, etc. On one occasion, many of his professed followers left Him, because they had a false idea of His coming, believing it to be a political redemption from the empire of Rome. So great was the exodus, that perhaps not many more than that original twelve apostles now reminded with Jesus. Asking whether they would also leave, Peter sums up the convictions of those remaining when he replies, “Lord, to whom shall we go? You have the words of eternal life.” (ESV – John 6:66 – 68). Jesus did then, and does now, and ever will possess those words of the good news of eternal life. We are all under a death sentence, for the wages of sin is death. But God’s Son fulfilled that sentence of death on our behalf, giving those who repent of their sins and trust in Him, eternal life instead. Words to Live By: Summing up Christ’s prophetic office, as Prophet, his mediatorship is downward from God to us. As a prophet, as the Prophet, He meets the problems of man’s spiritual ignorance, supplying us with spiritual knowledge of the most important kind, that which affects eternity, and where we will spend it. Are you still ignorant, or have you been brought to the saving knowledge of Jesus Christ? WLC 68 — “Are the elect only effectually called?